A few weekends ago I was brunching at ABC Kitchen and had some fabulous toast, and it was green! We weren't even exactly sure what was on it, or what was green, but it was memorable and intriguing. 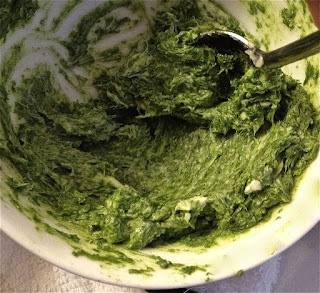 My dining friend looked it up and uncovered that the green spread on top was actually Ramp butter. I didn't even know that existed, nor have I cooked with the green veggie before. Walking through the Union Square Greenmarket this week, I stumbled upon a vendor selling bunches of ramps. Perfect! It was a sign to finally try it. I searched the internet for recipes on how to make the Ramp toast from ABC Kitchen (which Piggy KK wrote a great review for) and found a short how-to video from the restaurant's chef, Dan Kluger. 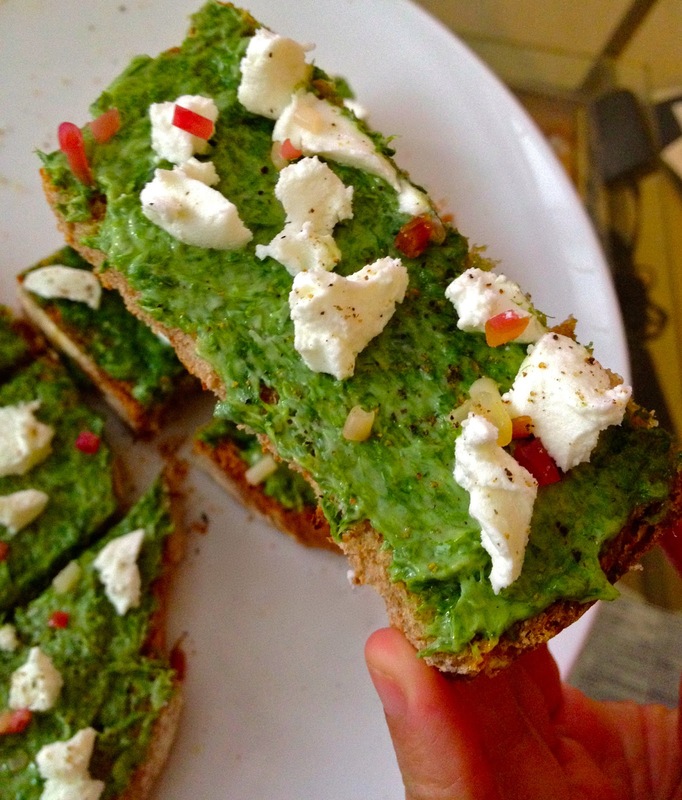 It was helpful in uncovering the ingredients - ramp butter, pickled ramp bottoms, goat cheese, and sourdough bread. But unfortunately it didn't really give any details on how to actually make the butter or pickled ramps. A few rounds of trial and error, and I finally wound up with a somewhat passable replication of it! After washing the ramps and chopping the stems off, I got started on pickling the ramp bottoms. Boil salted water and cook the ramp bottoms for 30 seconds. Then plunge the ramps in cold water and drain. Move ramps to a glass container with a tight sealing lid. Over high heat, stir 1/2 cup of water, 1/2 cup of apple cider vinegar and 1/2 cup of sugar until sugar is dissolved. Bring to a boil and add 4 tsp Pickling spices and 1 bay leaf. Pour mixture over the ramp bottoms. Cool on the counter, and then store in the fridge. The ramps will be ready to use in as soon as 2 days and can keep for months. Bring a half stick of unsalted butter to room temperature. Bring a pot of water to a boil in a saucepan. Cook the ramp leaves for 4 minutes, tossing the leaves continuously to make sure they cook evenly and don't clump. Drain the leaves and run them under cold water to stop the cooking. Squeeze excess water off the leaves and use a paper towel to soak up any residual water. Roughly chop the leaves and then pulse on High for 15 seconds at a time until leaves have been ground to a fine clumpy texture (I pulsed it for 15 seconds 4-5 times). Scoop the ground ramp leaves into a bowl and mash the leaves with the back of a spoon. Cut the butter into 1" segments. Mix the butter in with the ramp leaves using the back of a spoon again until very well combined. Add a pinch of sea salt to taste, mix well. Lightly brush olive oil on a slice of Sourdough bread. Toast bread. Let the bread cool for 1 minute, or until bread is just warm to the touch. Spread ramp butter on the toast. Crumble clumps of Goat Cheese and add Pickled Ramp bottoms. Sprinkle on sea salt and fresh ground black pepper to taste. Go ahead and take advantage of Ramp season! ENJOY! Birthday Steak and Creamed Spinach!